Raise your hand if you saw this coming. 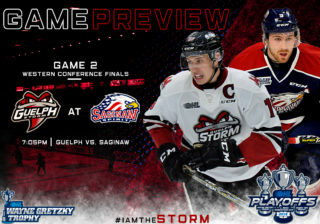 Rookie Nate Schnarr had a goal and an assist, fellow rookie Nicolas Sicoly had two assists and goaltender Michael Giugovaz stopped all 32 shots he faced as the Storm defeated the Knights for the first time in six tries this season with a 3-0 victory. 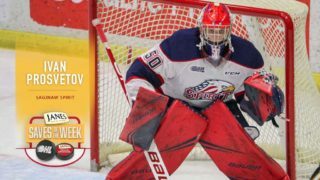 The goal was Schnarr’s first of his OHL career and Giugovaz’s shutout, which came against his former team, was the goaltender’s first of the season. After a chippy first period ended without a goal, Schnarr scored the game’s first goal and eventual game-winner just 2:43 into the second period. 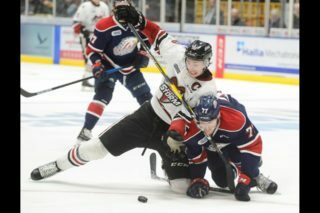 Sicoly split two London defenceman before sliding the puck to his left to a wide open Schnarr, playing in just his fourth game in the OHL, who snapped the puck to the top right corner of the net past Parsons’ glove. 6:40 later the home team made it 2-0. Rookie Nick Deakin-Poot, standing at the top of the Knights crease, collected a loose puck and slipped it through the legs of Parsons. 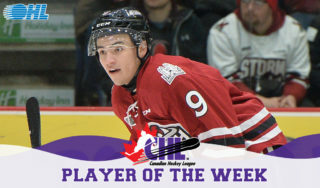 Playing some of his best hockey to date, Giugovaz continued his strong performance, making a number of incredible saves to keep the Storm lead. After killing off three London power plays in the third period, the home team got the insurance marker they needed. With 3:15 remaining and Parsons on the bench in favour of an extra attacker, Luke Burghardt scored an empty-net goal to seal the deal as the Storm beat the Knights 3-0. It was the first time London has been shutout this season. Final shots were 32-28 for London. 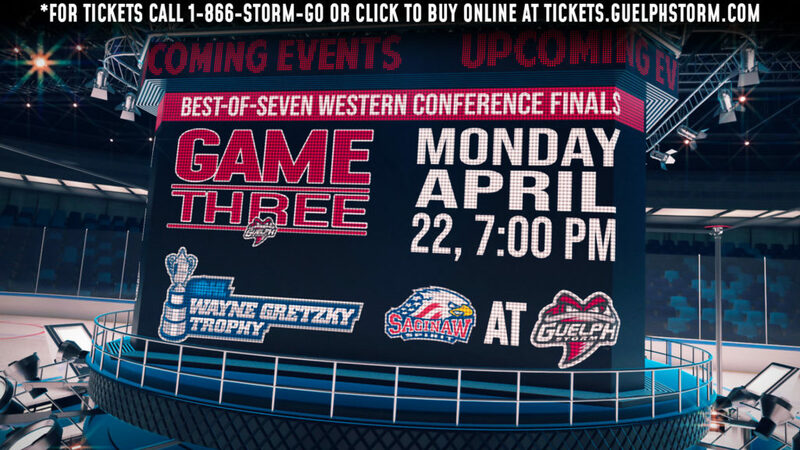 Guelph has now won four of their last five games and are back in action this Friday, Janaury 15 when the Owen Sound Attack visit the Sleeman Centre. Puck drop is at 7:30 p.m.
– Tonight’s game was the sixth and final meeting between the two teams this season. London won the season series 5-1. 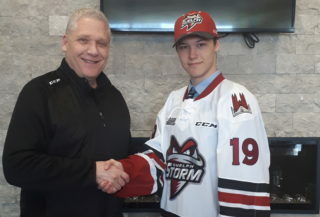 – Storm forward Nate Schnarr scored his first career OHL goal. – With 2 assists tonight, Nicolas Sicoly has registered points in three games this season with two of those games being multi-point performances. – With an assist, defender Kyle Rhodes now has 5 points, surpassing his career-high set last season. He now has points in two straight games for the first time in his career. – Guelph has won 4 of their last 5 games. 1st Period– No Scoring.Penalties-Tetrault Gue (interference), 3:08; Jones Ldn (hooking), 6:11; Carroll Gue (cross checking), 9:46; Marner Ldn (unsportsmanlike cnd. ), 10:42; Burghardt Gue (cross checking, unsportsmanlike cnd. ), 10:42. 2nd Period-1, Guelph, Schnarr 1 (Sicoly, Rhodes), 2:43. 2, Guelph, Deakin-Poot 2 (Sicoly, Schnarr), 9:23. Penalties-Yakimowicz Ldn (fighting, misc-helmet), 7:16; Rhodes Gue (fighting, misc-helmet), 7:16; MacDonald Ldn (unsportsmanlike cnd. ), 9:59; Tetrault Gue (unsportsmanlike cnd. ), 9:59; Graves Ldn (cross checking), 16:09. 3rd Period-3, Guelph, Burghardt 9 16:45 (SH EN). Penalties-McFadden Gue (closing hand on puck), 4:07; McFadden Gue (high sticking), 8:47; Berisha Ldn (tripping), 12:25; Jones Ldn (unsportsmanlike cnd. ), 12:25; Smith Gue (unsportsmanlike cnd. ), 12:25; Crawley Ldn (cross checking), 16:16; Smith Gue (high sticking), 16:36. Shots on Goal-London 10-10-12-32. Guelph 6-13-9-28. Power Play Opportunities-London 0 / 5; Guelph 0 / 4. Goalies-London, Parsons 20-4-2-1 (27 shots-25 saves). Guelph, Giugovaz 10-6-4-0 (32 shots-32 saves). Referees-Pat Myers (40), Quincy Evans (7). Linesmen-Jean-Francois Menard (52), Adam Harris (49).